In my other post Tamino’s Folly – Temperatures did Drop I demonstrated that we know temperature trend to a higher degree than Tamino has asserted. Several readers made the claim that Tamino was arguing that we don’t know the temps dropped due to weather noise, however that was not part of the post I was addressing. There is a serious problem with his argument which goes unsaid, not that his demonstration is terribly wrong just that the assumptions are designed with a predetermined conclusion. It happens right in the first paragraph. 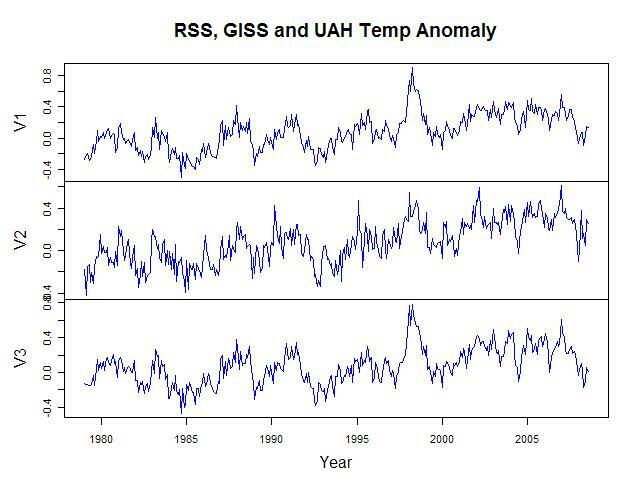 From my previous post we looked at the FFT of the three main temp metrics from which Tamino noticed a strong 1 year signal in the UAH weather. From Leif Svalgaard’s comments on my other post, the solar heating effect is compensated for on a monthly basis by some function. This creates a few problems, scientists need to know the response of the earth climate to solar forcing, the difference in albedo between the hemispheres, the phase angle lag created by the thermal mass of the climate system and any feedback mechanisms associated with the response to make an accurate correction. The phase of the one year trend I found in my last post means that (not surprisingly) the AGW guys have underestimated the annual response to solar heating in all three anomaly metrics. In their defense, they may have simply estimated the lag incorrectly. e.g. The differrence between two slightly out of phase sine waves is a sine wave. There is also a half year signal present in all three metrics. This kind of variation could be caused by seasonal effects or corrections between the hemispheres. Below are the three Fourier transforms I did of the three metrics. I found something quite interesting about Tamino Foster’s latest post. He did a Fourier analysis of measured temp data. He started with a difference in measurements between RSS and UAH, — Interesting coincidence that he just now started looking at the “difference” between measurement types this week. Odd considering that my posts last week weren’t worth reading and belonged in the dump. Anyway he found something quite interesting. A regular one year signal hidden in the temp data. Here is the original data. To Chris H, Raven and other posts. I do feel privileged to have the quality of comments I get, really it will keep me on my toes. Whether we disagree or not my point recently is to demonstrate some of the flaws in the math on global warming. Tamino has a good point which I cannot and won’t disagree with. His point is in an upslope in temp, assuming the weather noise we have, the local short term down slopes which WILL occur do not preclude a continued trend up. This post deals with your points. BTW:I verified his ARMA post today, it seems valid to me. However, — you knew that was coming. Ok, I can’t blame the posters from my last article. It is clearly my fault for not explaining what I did well enough. Fortunately for me, others have a better gift for this than I. I have referred to the Digital Diatribes blog repeatedly for trend analysis, simply because he does the best job on the internet of describing the measured trends of several key values. He posted this comment on Watts Up With That. I received an email with these. Ok, the truth is I didn’t care before if the downward trend is valid. I’m just a bit annoyed that Tamino (at Open Mind) and Real Climate won’t let me post on their blogs about it. In this post I demonstrate the folly of his conclusions. 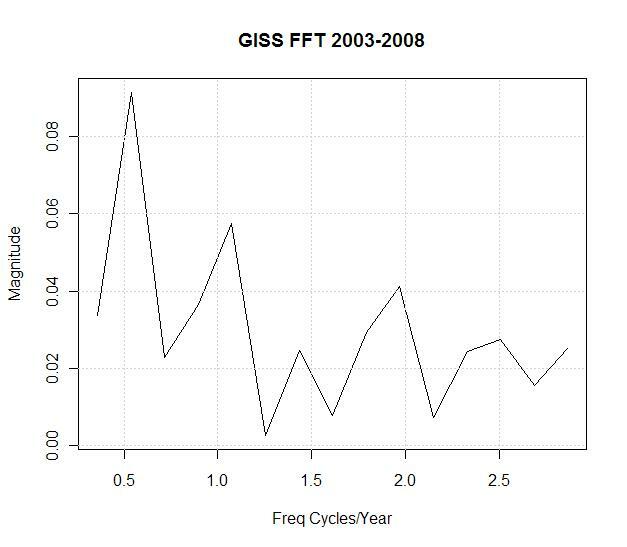 Tamino has made a couple of posts on how the last 10 year drop in temperature is not statistically significant so it isn’t real. He went too far in his last one and began claiming it was a tactic of some kind of creature called a denialist to confuse and confound the public. Let’s see what Tamino has been saying on his blog link HERE. Some of you might wonder why I make so many posts about the impact of noise on trend analysis, and how it can not only lead to mistaken conclusions about temperature trends, it can be abused by those who wish deliberately to mislead readers. The reason is that this is still a common tactic by denialists to confuse and confound the public. I just hate bad science. First he points out how Bjorn Lomborg made some comments about temperature decreasing, after placing the ever more popular label of denialist on him implying Lomborg’s statements were intended to confound and confuse the public. Heres the main point of what Bjorn Lomborg said. They (temperatures) have actually decreased by between 0.01 and 0.1C per decade. With secrets hidden for only the enlightened few to see. What happened next? As I discussed in part 1, after realizing what was happening I asked Mann or Gavin at Real Climate for an explanation. In my now old post below. How to Make a Hockey Stick – Paleoclimatology (What they don’t want you to know) It’s cute how green I was back then, in September. My first comment deletion by Real Climate mom would be proud. Ok, it’s time to summarize what I have learned from exploration of proxy data. I went back to Climate Audit and found the exact moment that I learned how hockey sticks were made. I do love hockey, it is by far my favorite sport. Probably half of my Canadian readers will stop reading when I say that I am a huge Red Wings fan. If you came here looking for a NHL discussion though, I apologize this post is about how the false mathematics behind the most famous hockey stick temperature curves. This post clearly shows that actual HS data can be made to support any conclusion. Hockey stick graphs are not temperature whatsoever but are in fact representations of the statistical distortion created by mathematical sorting of random or near random data. This entire post is actual proxy data from M08. I used CPS methods recommended in the latest hockey stick paper and many before it to produce these graphs. If this is your first time here recently see this article Will the Real Hockey Stick Please Stand Up? The first graph of this post is the final result after the 1209 series were magnified and averaged together. Vertical scale is SD units calibrated from 1850-1995. This is my first post which is based on R software. The point of this post is just to see the types of data going into the latest hokey hockey stick and what shape the groups provide. If you look at all the graphs after the first one, you might see components which add up to the shape of the final graph. Also, you will notice shapes which you can’t find. 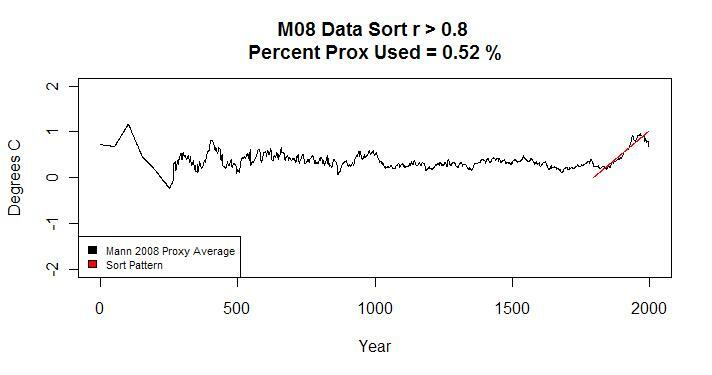 The fact that you cannot find certain valleys and peaks means very clearly that individual proxies had substantial influence in creating historic trends. Yesterday, I tried to call attention to my latest post at Real Climate and request an explanation of the fact that CPS methods and r sorting can create any pattern you want from the proxies in Mann08 including sine waves and negative hockey sticks. I have been snipped before from Real Climate so I saved a copy of my post before I sent it. I have just completed a post which demonstrates how you can pull any pattern you want from the M08 proxy set using CPS methods. Positive hockey sticks, negative ones, historic trends of any shape even sine waves. I would like someone to review and explain why I am wrong in my conclusions that these methods are faulty. I also implanted the CPS northern hemisphere result in red noise and used CPS to go find it. I found that the method distorts non-calibration range temperature scale. The red noise was not calibrated to proxy noise but I have used hundreds of different noise levels to the same effect. Your site deleted my first post on this subject, leading me to spend hundreds of hours in study and even create an entire blog just to react to what seems like bad mathematics. Now I posted this on his thread “Progress in reconstructing climate in recent millennia” which is a relatively old thread without much activity so my post was on topic. I wasn’t surprised not to get a reply. I posted another comment on Open thread #6 at Tamino, hoping to get some of that open mind discussion group going on it. Tamino has in the past been impatient with me for asking Ian Jolliffe if he was the nature reviewer but he always let me post. This time though, when my first comment didn’t make the cut I assumed that it was my mistake so I tried again. The second comment didn’t make the cut for his Open thread either. BLOCKED! From an open thread. Twice. I won’ t abuse you with my venting today. Mostly pictures. Pretty interesting ones I think. I used the CPS method today with actual proxies from M08. Instead of the infilled data with the fake hockey stick glued on the end I used the original original 1357 series before processing. I also chopped off the 95 Luterbacher series which aren’t really proxies, they are temperature. It didn’t make any big difference to the shape of graphs in my results but I don’t like em.